There are 3 new guild skills will be updated. 1.1. Emergency Move : Can only be used in WoE map and used by guild master. Increases movement speed of guild master and nearby guild members for 10 seconds. 1.2. Charge Shout Flag : Can only be used in WoE map and used by guild master. Places the staging flag in the target location. Last for 5 minutes. 1.3. Charge Shout Beating : Can only be used in WoE map and used by guild members. Teleport to staging flag placed by guild member immediately. guild members must be in the same castle to use this skill. The guild skills will be improved to can be placed in shortcut window and will be improved as following. 2.1 Restoration : Reduces fixed casting time from 10 seconds to 1 second. Removes 5 minutes of guild skills global delay. Adds 3 minutes cooldown. 2.2 Regeneration : Removes 5 minutes of guild skills global delay. Adds 3 minutes cooldown. 2.3 Battle Command : Removes 5 minutes of guild skills global delay. Adds 3 minutes cooldown. 2.3 Urgent Call : Removes 5 minutes of guild skills global delay. Adds 5 minutes cooldown. 3. Expands level of expanded classes. Base level of Star Emperor, Soul Reaper, Kagerou, Oboro, Rebellion and Doram Summoner will be increased to 185. Job level of Star Emperor, Soul Reaper, Kagerou, Oboro and Rebellion will be increased to 65 while Doram Summoner will be increased to 55. The EXP table will be adjusted to be the same as normal third classes. And max level of some skills of Star Emperor, Soul Reaper, Kagerou, Oboro and Rebellion will be increased and adjusted. - Solar Burst : Increases max level from 7 to 10. Increases area of effect from 5x5 to 7x7. Damage will be increased from 1600% to 2450% on level 7 and 3200% on level 10. - Full Moon Kick : Increases max level from 7 to 10. - Falling Star : Increases max level from 7 to 10. Soul energy will longer be reset when changing map or reconnect. - Espa : Increases max level from 5 to 10. On level 10 the skill will no longer consume soul energy. - Eswhoo : Increases max level from 7 to 10. On level 10 the skill will reduce soul energy consumption to 1. - Evil Spirit's Curse : changes debuff inflicting from [Curse] to the new debuff [Evil Curse]. Target under Evil Curse will receive more damage from shadow property by 100% (Reduces effect on boss to 20%). - Curse Explosion : Increases max level from 5 to 10. Changes bonus damage against target under Curse debuff to Evil Curse debuff. - - Increases Blaze Shield damage from 10% to 20% per 1 charm. - - Increases Exploding Dragon damage from 15% to 100% per 1 charm. - - If 10 Fire Charms are collected. enchants weapon with fire property and increases physical damage against earth property enemies by 30%. - - Increases Freezing Spear damage from 5% to 20% per 1 charm. - - Increases Snow Flake Draft damage from 25% to 100% per 1 charm. - - If 10 Ice Charms are collected. enchants weapon with water property and increases physical damage against fire property enemies by 30%. - - If 10 Earth Charms are collected. enchants weapon with earth property and increases physical damage against wind property enemies by 30%. - - Increases Lightning Jolt damage from 15% to 20% per 1 charm. - - Increases First Wind damage from 10% to 100% per 1 charm. - - If 10 Wind Charms are collected. enchants weapon with wind property and increases physical damage against water property enemies by 30%. - - Increases max level from 5 to 10. Reduces skill delay from 1 second to 0.5 seconds. - - Variable casting time is adjusted to 1.5 seconds regardless of skill level. - - Changes from ground skill to target skill. - - Changes damage formula. Adjusts bonus damage from caster's Agi and Dex to Str. Damage will be increased depends on caster base level. - - Reduces kunai consumption from 8 to 2. - - Increases max level from 5 to 10. Changes cooldown to 3.1 seconds on level 10. Damage will be increased depends on caster base level. - - Increases area of effect from 3x3 to 5x5. Changes from ground skill to target skill. - - Damage will be increased depends on caster base level. - - The skill will increases Kunai Explosion, Kunai Splash, Cross Slash and Swirling Petal damage by 20%. - - Increases max level from 5 to 10. Changes damage formula by reduces influence of Desperado skill level. - - Increases skill damage. - - Increases max level from 5 to 10. Reduces fixed casting time from 1 second to 0.7 seconds. Adjusted variable casting time to 1 second. - - Reduces cooldown from 2 seconds to 1 second. Adds skill delay by 1 second. - - Changes damage formula. Damage will be increased depends on caster base level. - - Increases max level from 5 to 10. Reduces cooldown from 30 seconds to 20 seconds. Reduces skill delay from 2 seconds to 0.5 seconds. - - Skill will deal additional damage against target marked by Crimson Marker and this additional damage also affects nearby target too. - - Area of effect is increases to 7x7 on level 6 and higher. - - Removes stun inflicting. - - Increases max level from 5 to 10. Reduces cooldown from 5 seconds to 3.5 seconds. Reduces skill delay from 2 seconds to 1 second. - - Change skill logic to target skill. HP and SP table of Super Novice will be adjusted. some skills (Flasher, Sandman, Freezing Trap, etc.) will be removed. Skills such as Guard, Repair Weapon and Back Stab will be added. 3 exclusive skills for Super Novice will be added. Passive skill that increases incoming heal effectiveness along with MaxHP, MaxSP and Atk of Super Novice. Passive skill that increases incoming heal effectiveness along with MaxHP, MaxSP and Matk of Super Novice. Active skill that recovers HP and SP of nearby target for the duration. Minstrel and Wanderer skills will be adjusted as below. 5.1 Voice Lessons : The skill will have influence greatly on Minstrel and Wanderer songs. 5.2 Improvised Song : Reworks skill. The skill will remove chorus buffs on target instead of casting random magic. 5.3 Death Valley : success rate is set to 100%. 5.4 Gloomy Shyness : Reworks skill. The skill can be used in PVP and WoE map only. Removes bonus damage on certain skills. Adds debuffs that increases skill delay and SP consumption of target enemies. The existing effects, reduces target flee, movement speed, attack speed and removes target mount still remains. 5.5 Circle of Nature : Change from recovers HP per second to increases HP recovery rate. 5.6 Deep Sleep Lullaby : Increases success rate and the skill will only affect enemy players within target range. 5.7 Great Echo : Removes bonus from additional performers in party. Increase skill damage. Damage will be increased depends on caster base level. 5.8 Lerald's Dew : Change increased HP from flat amount to percentage. Reduces skill cooldown. Additional bonus HP will be increased depends on caster's Voice Lessons level. Removes bonus from additional performers in party. 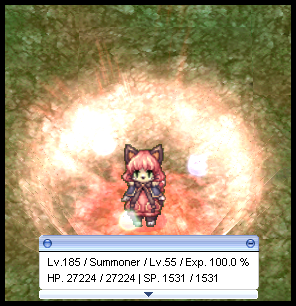 5.9 Song of Mana : Improves SP regeneration effect. Reduces skill cooldown. Adds SP recovery effect. Additional bonus SP recovery will be increased depends on caster's Voice Lessons level. Removes bonus from additional performers in party. 5.10 Sinking Melody : Improves SP draining and Int reduction effect. Reduces skill cooldown. Additional success rate will be increased depends on caster's Voice Lessons level. Removes bonus from additional performers in party. 5.11 Warcry from Beyond : The skill will reduces target Str instead and Improves MaxHP reduction effect. Reduces skill cooldown. Additional success rate will be increased depends on caster's Voice Lessons level. Removes bonus from additional performers in party. 5.12 Song of Destruction : Reworks skill. The skill will double amount of damage enemy player received for certain duration. The duration will be increased depends on caster's Voice Lessons level. 5.13 Saturday Night Fever : Changes HP/SP draining effect to disabling target HP/SP recovery rate instead. Hit and Flee reduction will be changed from percentage to flat value. Additional success rate will be increased depends on caster's Voice Lessons level. Removes bonus from additional performers in party. 5.14 Infinite Humming : Reworks skill. The skill will grant targets to be immunity to burning, deep sleep, crystallization, freezing, guillotine cross's poisons except oblivion curse for certain duration. The duration will be increased depends on caster's Voice Lessons level. 5.15 Dances with Wargs : Adds bonus long ranged physical damage. Removes bonus from additional performers in party. 5.16 Windmill Rush : Adjusts Atk bonus formula. Atk bonus will be increased depends on caster's Voice Lessons level. Adds bonus movement speed. Increases duration from 60 seconds to 180 seconds. 5.17 Moonlight Serenade : Adjusts Matk bonus formula. Matk bonus will be increased depends on caster's Voice Lessons level. Increases duration from 60 seconds to 180 seconds. 5.18 Swing Dance : Slightly reduces attack speed bonus. Increases duration from 60 seconds to 180 seconds. Attack speed bonus will be increased depends on caster's Voice Lessons level. 5.19 Lover Symphony : Change Mdef bonus from percentage to flat value. The skill tree of Sura will be changed in addition of skill adjustment as below. 6.1 Lightning Ride : Number of attack hit will match skill level (5 hits on level 5). Due to changing number of attack hit the skill formula will be changed. Changes bonus damage condition from equipping wind element weapon to knuckle weapon instead. 6.2 Gentle Touch - Energy Gain : Changes the skill to can be used with Gentle Touch - Convert and Gentle Touch - Revitalize. 6.3 Gentle Touch - Cure : Reduces sphere consumption from 2 to 1. 6.4 Gentle Touch - Convert : Reduces sphere consumption from 2 to 1 can be used on self and party members only. Bonus Atk will be depends on target's WeaponAtk and this bonus will be increased as percentage as skill level. Removes MaxHP and Mdef reduction debuffs. 6.5 Gentle Touch - Revitalize : Reduces sphere consumption from 2 to 1 can be used on self and party members only. Changes bonus Def from SoftDef to HardDef. 6.6 Earth Shaker : No longer consume sphere. No longer require Dragon Combo as prerequisite skill. Changes damage formula. Removes stun inflicting. Target attacked by this skill will take more damage from Rampage Blast by 50% for 5 seconds. 6.7 Rampage Blast : Reduces sphere consumption from all caster has to 5 and can only be used while under Fury state. No longer require Earth Shaker as prerequisite skill. Changes damage formula as consumed sphere is changed. 6.8 Sky Blow : No longer require Dragon Combo as prerequisite skill. Changes damage formula and removes knock-back inflicting. Slightly increases SP consumption. 6.9 Gates of Hell : Cast range will be 7 regardless skill level. Reduces sphere consumption from 5 to 2. Changes SP consumption from percentage to 100. 6.10 Tiger Cannon : No longer consume HP/SP as percentage but bonus damage from HP/SP still remains (skill will check caster's MaxHP/MaxSP to calculate damage instead). Damage will be increased when combo after Fallen Empire. No longer drain SP from enemy player. 6.11 Knuckle Arrow : Damage will be increased when attack boss monsters. 7. Improves third classes skills effect. The below is new effect of Psychic Wave, Diamond Dust, Tetra Vortex, Crimson Rock, Tiger Cannon, Rampage Blast and Severe Rainstorm respectively. 8. Improves Water Field effect. 9. Add function to turn off buying stall window.